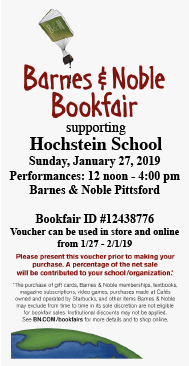 Support Hochstein by making purchases at Barnes & Noble, Pittsford Plaza, 3349 Monroe Ave, Rochester, NY 14618. Drop by from 12:00 to 4:00 pm as Hochstein musicians will be performing during this time. A percentage of the net sales will be contributed to Hochstein. Click here for a PDF of the voucher to use to make your purchase. Please present your voucher prior to making your purchase. Online sales count too. Some restrictions apply.